Գիտական տեղեկատվության վերլուծության և մոնիթորինգի կենտրոնը (Կենտրոն) գործում է ՀՀ ԳԱԱ Ինֆորմատիկայի և ավտոմատացման պրոբլեմների ինստիտուտի կազմում 2010 թվականի հունվարից։ Կենտրոնն ունի երեք սեկտոր. Gzoyan E. G. The role of governmental and non-governmental organizations (including international organizations) in enlarging the interstate mobility of scientists and professionals in humanities and social sciences in Armenia. International Conference (19-23 October 2011, Kiev, Ukraine) 118-120. 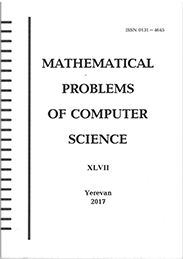 H index and Ranking in Scientometrics, Bulletin N3, Center for the Scientific Information Monitoring and Analysis, Yerevan 2012, 45 p.
N. Ayvazyan, E. Gzoyan, ‘The Appraisal of CIS States Intellectual Capital’, Banber Erevani hamalsarani, Social Sciences (2012)136.5: 50-60. Ayvazyan N., Gzoyan E. Mapping the intellectual capital of Post Soviet States. Service Innovation Yearbook 2011-2012, European Commission Information Society & Media, pp. 138-147. Modern Description of Social Sciences and Humanities, Bulletin N2, Center for the Scientific Information Monitoring and Analysis, Yerevan 2011, 79 p.